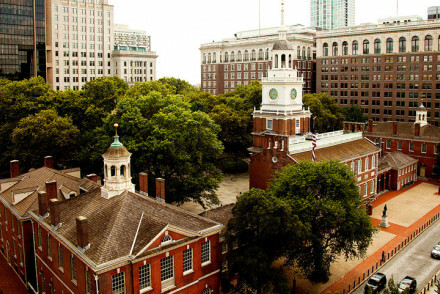 Philadelphia, the largest city in the north-eastern state of Pennsylvania, is steeped in history. It was the site of the 1776 Declaration of Independence and, a few years later, the signing of the Constitution. Full of iconic sites, such as City Hall, Independence Hall and the Liberty Bell, it also boasts a rich arts and cultural scene, with the Museum of Art, Benjamin Franklin Museum and the wonderful art collection of the Barnes Foundation. Our choice of the best places to stay in Philadelphia ensures you can easily explore these sights. The art treasures are clustered together on the north-western side of the city centre. Here you’ll find the largest collection of Renoirs and Cézannes at the Barnes Foundation, along with other great names such as Picasso, Matisse and Van Gogh. Close by you’ll find the wonderful sculptures of the Rodin Museum. The ‘historic’ sites are to the east of the central downtown area. But Philadelphia has so much more. Throughout the city, you’ll find over 3,600 murals brightening public spaces. Or you can wander the Avenue of the Arts, the city’s theatre district, and perhaps check out a show for the evening. At the Eastern State Penitentiary, you can see the cell where gangster Al Capone was kept - in considerable style. The city also has the oldest outdoor market in the States, the Italian Market. The Reading Terminal Market is another great place to browse for artisan and speciality foods, with over 100 stalls. Talking of food, you won’t go hungry. The city offers choices from fine-dining to bistros, outdoor cafes (over 250) to food trucks. Check out Love Park for the latter. Above all, the city has a vibrant, cosmopolitan atmosphere and ethnic mix. This is largely because it was a great railroad hub and industrial centre in the 19th century, attracting a mass influx of Europeans. Our range of the best places to stay in Philadelphia gives you the choice of being close to the historic centre, in the downtown area or overlooking the Delaware River. Truly something for everyone! 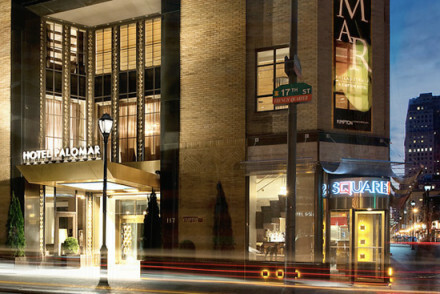 The 230-room Hotel Palomar has several family suites and is in the heart of the city, close to Reading Terminal Market. Rooms are sleek and contemporary with hints of art-deco styling (reflecting the hotel's architecture) and there are bicycles to borrow. In a quiet, leafy area, the owner-managed Rittenhouse 1715, is a great family-choice B&B with just 23 rooms and all sights within easy walking distance. Hotel Monaco, in the former Lafayette Building, offers Greek Revival-styled exteriors and colourful, eclectic interiors with hints of Art Deco. It's in a peach-perfect position for exploring the city's icons such as Liberty Bell and Independence Hall. The 15-room, 18th-century, Morris House Hotel is not only in the city's historic heart but is itself a National Historic Landmark. Rooms are furnished with antiques while some have hardwood floors and original fireplaces. Bathrooms are luxurious in marble. Nothing here that you like? Widen the net and check out all our recommendations in Pennsylvania, or contact one of our friendly gurus for advice. 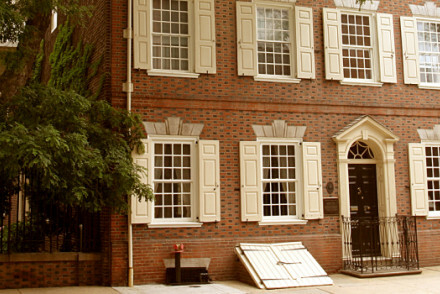 Built in 1787, the charming Morris House is now one of Philly's leading boutique hotels. Original sash and shutter windows, antique furnishings and wooden floors, combine with the finest linens, bathrobes and service to give this hotel it's unique blend of history and opulence. A must visit! Sights nearby - Liberty Bell, Christ Church & Ben Franklin Grave. Local exploring - Bang in the centre of town, so ideal for checking out all of Philadelphia's best bits. Sights nearby - Benjamin Franklin Memorial. 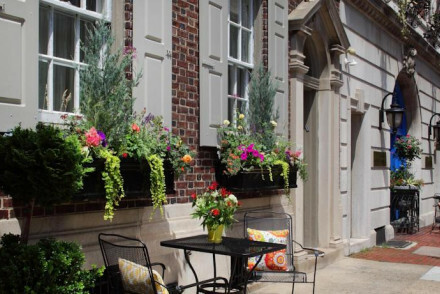 This hotel sits in the perfect location for exploring the historic centre of Philadelphia. Colourful, vibrant and energetic rooms, with a hosted complimentary wine hour every evening. Includes the unique views of Liberty Bell Centre and historic parks. Excellent choice for a Philly city break. Local exploring - A great central location plus hotel bikes to borrow make this ideal for exploring the sights. Sights nearby - Walking distance from the Independance Hall, Liberty Bell, buzzing boutiques - and more! Nestled in a leafy street around the corner from historic Rittenhouse Square, this boutique hotel hits the spot for family city exploring. Classic, comfortable rooms & suites offer stylish, understated luxury accommodation in the heart of the city. Delicious breakfasts & restaurants close by. Great walks - Everything seems to be within walking distance! 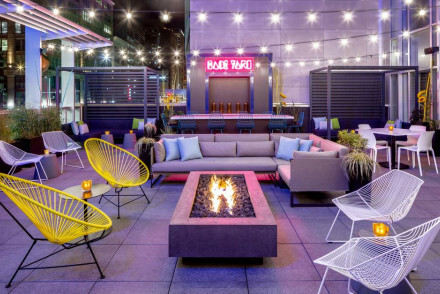 A cool new addition to the Marriott’s Aloft brand, in central Philadelphia. The hotel is housed in the historic 1920's Liberty Title Building, and has retained its vintage charm from high ceilings, original windows and really quite spectacular artworks. With a lite bite restaurant, gym and a bar.